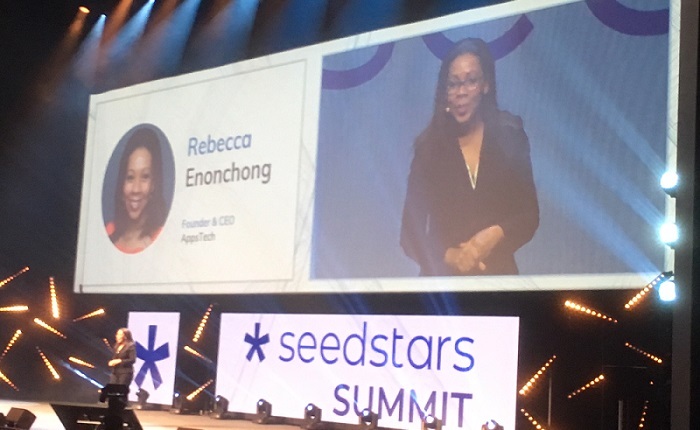 That’s according to Rebecca Enonchong, founder and chief executive officer (CEO) of global enterprise application solutions provider AppsTech, who was speaking at the Seedstars Summit in Lausanne, Switzerland, last week. Enonchong is no stranger to seriou business challenges. She launched AppsTech in the US (United States) in 1999, where she faced the inevitable challenges with being a foreign, female entrepreneur in the tech field. “I decided I was going to be a global company from day one. Nobody told me a foreign black woman in tech couldn’t build a global company,” she said. Enonchong pretended she was a corporate when she first launched AppsTech, and mimicked corporate websites. Her business cards had no title on them, so she could claim any role. “So many people couldn’t see that behind this global company was a foreign black woman,” Enonchong said. It had always been Enonchong’s goal to launch her business back home in Cameroon, something she did not think would be too challenging after the obstacles she had overcome building her business in the US. She recalled hearing someone say that to be an entrepreneur you had to be “crazy”. “Well, to be an entrepreneur in Africa you must be raving mad. Building a business as a black African woman in tech in the US in 1999 was nothing compared to doing it in Africa in 2004,” said Enonchong. However, she advised entrepreneurs to react in the right way to disappointments and challenges. “Rather than be angry, as entrepreneurs we take negative energy and make it into something positive,” she said. Enonchong herself got active in helping the African tech ecosystem grow from the ground up, co-founding Cameroonian incubator ActivSpaces and the Cameroonian Angels Network. “We started to develop and build the ecosystem, not just in Cameroon but across the African continent,” she said.